 FM Approvals has been made aware of an automatic fire sprinkler bearing a counterfeit FM Approvals mark located in Lithuania. FM Approvals has neither tested nor certified this product. The sprinkler bears the marking “ANGUS” on the wrench boss but the identity of the manufacturer is unknown. 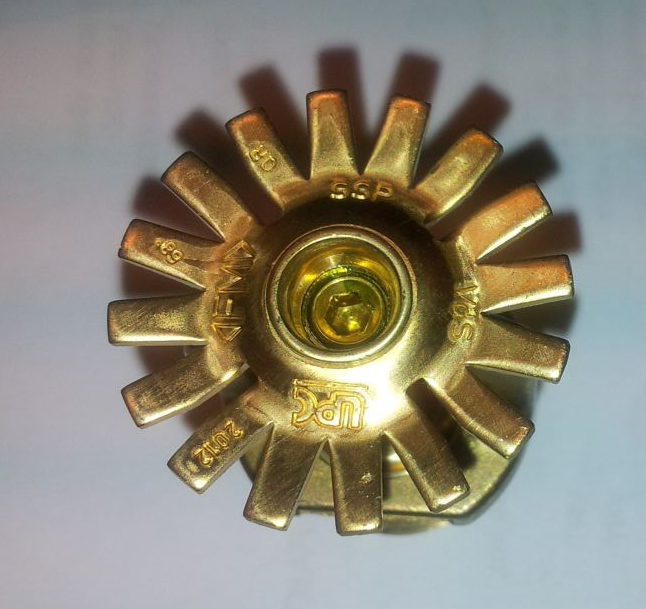 The product is similar in appearance to Angus Model S standard spray pendent sprinkler. 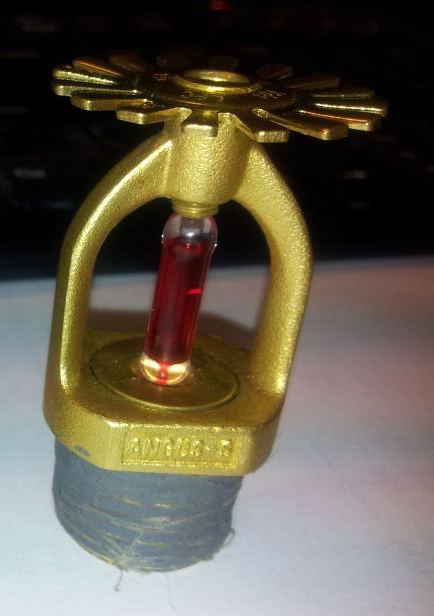 However, this counterfeit sprinkler was not produced by Angus Fire. 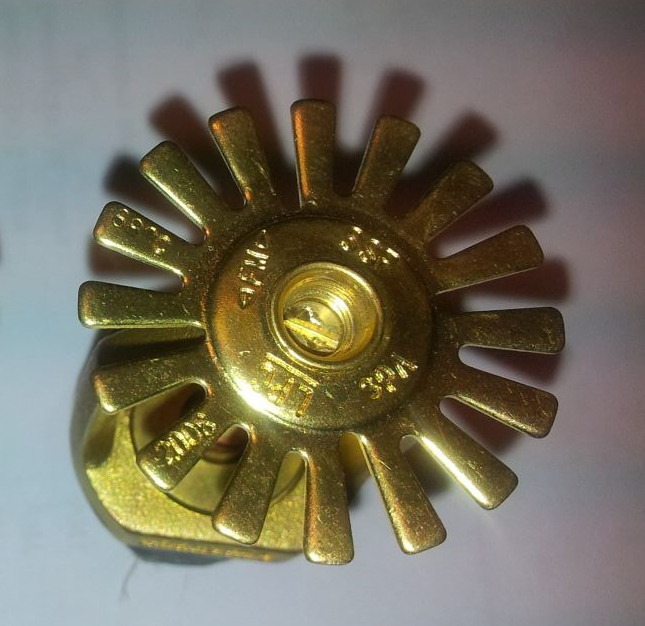 ½” NPT frangible bulb type automatic sprinklers. There is no evidence these products have ever been tested to the requirements of any testing and certification organization, including FM Approvals. As such, these automatic sprinklers cannot be relied upon to react to or control a fire. Failure by any of the following mechanisms is possible: failure of the thermal element, orifice leakage, premature or delayed operation, bulb strutting (incomplete fracture), ejection of the deflector, inadequate or excessive discharge rate, corrosive attack, failure to operate, failure to produce an adequate discharge pattern, etc. Of further note is the suspected use of an o-ring type orifice seal, a design which has historically been proven to be unreliable and possibly dangerous. Some o-ring type sprinklers have been subject to mandatory recall per the United States Consumer Product Safety Commission. 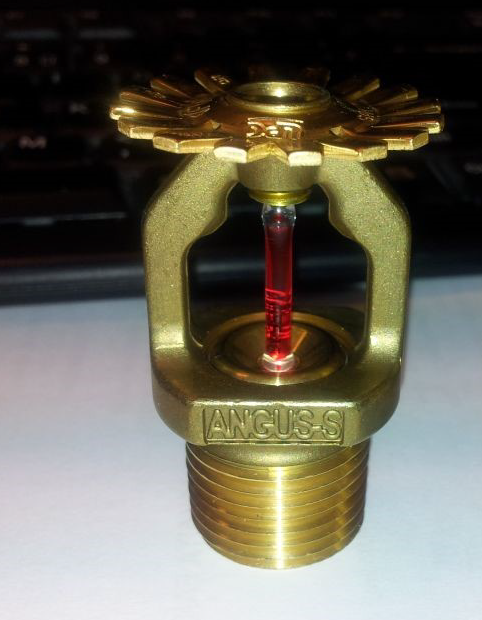 Figure 1 shows an authentic Angus Model S K5.6 standard spray pendent type sprinkler on the left and the counterfeit sprinkler on the right. The shape of the counterfeit sprinkler frame, particularly the frame arms, is different from the authentic version. Additionally, the counterfeit sprinkler uses a bulb seat (indicated by the blue arrow) with a flat profile across the top while the bulb seat on the authentic Model S has a slight depression towards the center where the end of the frangible bulb is supported. Figure 2 shows a close view of the deflectors of an authentic Angus Model S sprinkler (left) and the counterfeit sprinkler (right). The shapes of the deflectors are very similar as are all of the stamped markings. The yellow arrow on the right indicates the counterfeit FM Approvals marking. The red arrows highlight the load screws of the two sprinklers. The authentic sprinkler uses a socket hex head type load screw while the counterfeit sprinkler uses a slotted head type load screw.